February 27, 2016 By Tina M 9 Comments This post may contain affiliate links. Read my disclosure policy here. Last year at this time I wrote a post featuring a bunch of ideas for April Fool’s Day. I had no idea it would get the response it did, but it was very popular and many people commented and left their own ideas. I learned there are some really funny people in this world! Some of those ideas had me laughing So. hard. Food. If you are going to do a food-related joke, I recommend doing it about midnight (so the very start of April Fool’s). That way they are NOT expecting it at all. This helped me gain a lot of enemies in college. Think Chocolate covered cotton balls stringing from people’s teeth….or how about toothpaste-filled homemade oreos? Put Googley Eyes On His Lunch. This one is totally harmless, but might bring a smile. Mess With His Phone. Change his ringtone to something totally lame or obnoxious or promiscuous and call him while he is at work. OR…Set random alerts/messages to go off all day. Send a Message. Send him off to work with a loving little pat on the bum, and make sure to leave a fun sticker or note attached without him knowing. It could be something like “I have no clue this is here. Applaud every time you see me” or something random and silly that will have him wondering what’s going on. Special Outfit. Tell your husband that you are headed to bed and that you are putting something “special” on for him. If he thinks what I think he might think, he won’t be too far behind you! Be hiding under the covers in footy pajamas, or something ridiculous that will have you both laughing for years to come. Car Switch. Find your spouses vehicle at work and move it to another spot. Or, if he/she has keys to your car, switch out his for yours and park it in another stall. Drawer Switch. Move your husbands drawers around so he can’t find what he is looking for in the morning! Change the Language on His Phone. Hasn’t he always wanted to learn Portuguese? 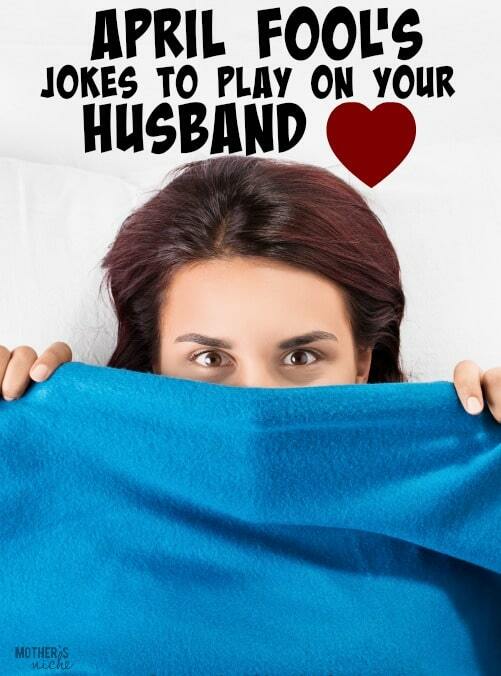 Be the “Funny Wife” at his work. Sometimes it’s fun to get the co-workers involved in some funny, harmless jokes. Replace the toilet paper with this, or put a big candy bowl in the break room full of M&Ms, Skittles, and Reeses Pieces all mixed together. Have some other fun ideas for April Fool’s pranks? Leave us a comment, we’d love to hear your ideas!!! This post originally appeared on Somewhat Simple. For couples who are trying to conceive or having trouble trying to conceive, #12: fake a pregnancy test, is really not funny. the pregnancy test isn’t funny. it isn’t a joke. please take that one off this article. I struggle with fertility as well as miscarried more than once. Fake pregnancy test is NOT funny. Why is the pregnancy one still on here?? That isn’t a joke and it isn’t funny. Please take that off! I would expect so much better from a site like this. People relax! I too was infertile for 10 years, it’s just a joke so laugh or don’t laugh and move on. Lighten up a little!